When winter rolls around in cold climate, we rarely give much thought to the tools we've stored in the garage, barn, shop, or shed. This can be an expensive mistake because many tools can suffer damage of some type by kept in the cold all winter long—especially power tools that you may use in sub-freezing temperatures. Here are some tips for storing tools safely in wintertime. Most hand tools generally will not suffer any damage from being stored in a cold garage or shed. Freezing temperatures, however, can make many metal or plastic parts brittle and particularly susceptible to breakage if you use them at very cold temperatures. To avoid this, get into the habit of taking hand tools out of cold storage before use; let them sit inside the house for an hour or more before use. Also, keep in mind that metal tools can rust. Big swings in temperature and humidity can accelerate that process. 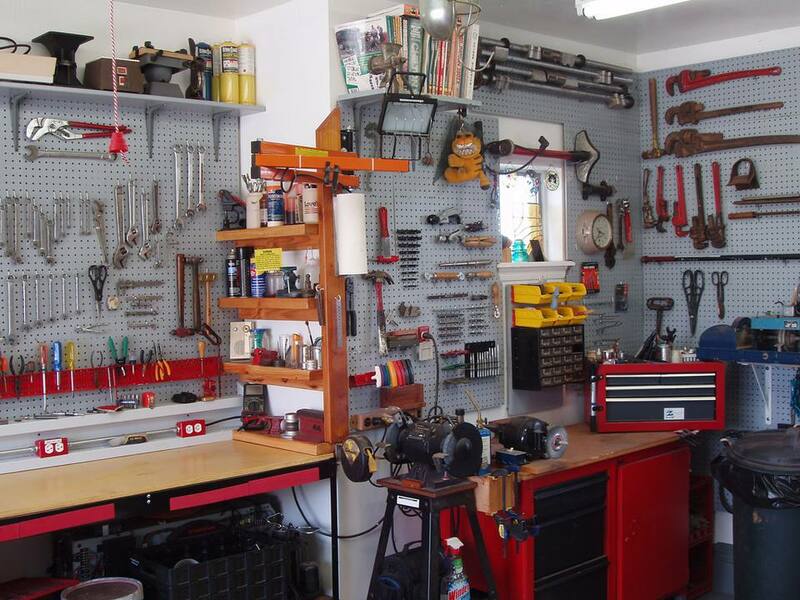 If you are worried about rust, try to find a good spot inside the house for tool storage. If you do store them indoors, make sure to clean them carefully before storing them, and perhaps apply a fine oil or rust protector to all metal surfaces. Winter air in most regions with very cold temperatures is typically fairly dry and not likely to rust tools over the course of the winter. But if you bring them into the house, especially to store them in a basement, rust can then be a problem. And if you live in a coastal area where winter air is damp rather than bitterly cold, rust is more likely. If you are storing your tools in damp conditions, consider using a dehumidifier in the space where you are storing your tools. Any power machinery will face some stress if it is used in very cold conditions, and your tools are no different. At the motors heat up, the stress of metal parts going from very cold temperatures to very warm may cause some tools to suffer an early death if this pattern happens frequently. For this reason, it is better to store power tools indoors if they will be used over the winter. Most tools with electrical motors contain oils and grease which should be allowed to warm up a bit before using the tool. So if you have stored a saw or other piece of power equipment in a cold space, bring it indoors for two hours or so before using it. Lubricants will be more effective if they are allowed to warm up to room temperature before using the tools. This applies even if the tools will be used outdoors—bring them indoors first to warm up before taking them back outdoors to cut or drill. Pneumatic tools usually come instructions on what kind of lubricants to use if the tools will be used outdoors. Try to keep cordless power tools and their chargers inside during cold weather. Freezing temperatures seem to accelerate battery discharge, and many cordless tools come with a warning that the chargers won't work when cold. Drain the gasoline (or add a gasoline stabilizer). Gas that stands in the tank for more than one month can form a layer of varnish on the inside of the fuel components, and draining the gas reduces this problem. Or, you can add a can of gasoline stabilizer to the tank. Change the oil on 4-stroke engines. This will keep dirt and other particles in the oil from sticking to parts of the engine. Seal the fuel cap. Engines emit small amounts of fumes even when they aren't running. Cover a vented fuel cap with a piece of aluminum foil to prevent evaporation. If you regularly work in a garage or outdoor workshop, equipping the space with a heater is a good idea. You can either heat up space to a comfortable temperature just before work sessions, or you can keep the heaters running all winter at a low setting to keep the temperature just above freezing. Tools need not be at the indoor room temperature to operate well—a temperature just above freezing is all you need.